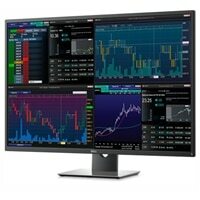 Increase productivity for specialized users in a single array offering crisp text, graphs and colors with the 43 inch Dell Multi-Client Monitor | P4317Q. 4K large screen experience: The 43 inch display with high-performance monitor scalar offers exceptional clarity up to Ultra HD 4K. Multi-client capabilities: Connect up to four independent clients to a single monitor with customized views, all without bezel breaks, so you can take total command of your tasks. Simplify multi-monitor setups: Fewer cables, single mount setup and RS232 connection offer easy manageability.